Here’s a fun and easy recipe: homemade egg pasta. It’s just two basic ingredients: flour and eggs. You can use this to roll out in flat sheets for cutting into fettuccine noodles or tagliatelle. It’s also perfect for filled pastas such as ravioli or tortellini. The fun part is you don’t even need a mixing bowl – just make a “bowl” out of flour right on your work surface and place the eggs in the middle. We used a hand-crank pasta machine to roll out the dough. Our kids thought this was great. It was like a PlayDoh Fun Factory – except we got to eat our work. I cut some of the pasta dough into fettuccine and spaghetti noodles, and used a hand stamper tool to make ravioli another time. Of course there are tons of flavors and liquids you can add to this basic pasta dough: try 6-10 oz. of spinach, or a teaspoon of grated lemon zest and 6 oz. grated Parmigiano-Reggiano cheese, or even ½ cup dry white wine to your dough while mixing. Herbs and spices (basil, parsley, etc) or even vegetable purees can be great additions. And if you’re making ravioli or tortellini, there are so many delicious options for the filling besides the usual ricotta: for example butternut squash, mushrooms, blue cheese, etc. I made the batch in the photos with just plain old, boring, flour, since we have a bunch of it. I do want to try switching up the flour, though, and experiment with cornmeal, rice, semolina, whole wheat, and/or buckwheat. Anyway, here’s the basic recipe. It makes approximately the same amount as 1 pound of store-bought dried boxed pasta. MIX: Mound the flour in the center of your work surface. Using your hands, make a well in the middle that will be wide enough and deep enough to hold the eggs. Add eggs, and any optional liquids or flavoring. Using a fork, beat the eggs (and any liquids/flavors). Gradually incorporate small amounts of flour from the sides of the well as you go, until all the flour is mixed in. This will be a lumpy mess, but do not worry. The next step will take care of that. KNEAD: Knead for 3 minutes or so. If the dough is really sticky, add a little more flour. The dough should be slightly springy and just a tiny bit sticky. Knead for 10 additional minutes until the dough becomes smooth. Wrap ball-shaped dough in plastic wrap and let sit at room temperature, for 30 to 60 minutes. ROLL OUT (<– said in my best Transformers voice): Using a rolling pin (and extra flour for dusting) or pasta machine to turn the dough into sheets. Cut into desired shapes, or add filling if you’re making stuffed pasta. Tip: I sprinkled a tiny bit of cornmeal on the dough before I put it through the roller the first time to keep it from sticking, and I put a tiny amount of cornmeal on the plate for the finished pasta and tossed the noodles around to keep them from sticking. To keep noodles from drying out, cover with a damp towel as you go. COOK: Bring 6 to 8 quarts of salted water to a rapid boil. Add pasta, and boil until firm but not mushy (depending on the thickness of your pasta, anywhere from 30 seconds-2 minutes or so). Drain and serve. Drain, reserving 1 c. of pasta water, and set both aside. In the empty pan used to cook the pasta, heat butter and EVOO over medium heat. Add onions and garlic and saute for a couple of minutes. Pour in tomatoes, red wine, and add sugar and spices. Stir and cook over low heat for 25 to 30 minutes, stirring occasionally. Remove from heat and stir in cream. Add cheese to taste, then check seasonings, adjusting if needed. Stir in pasta, thin with some of the pasta water (if needed). Add chopped basil and serve. Brush bread slices with EVOO and sprinkle with garlic. Place on a baking sheet. Broil in the oven for 3-5 mins until toasted. In a bowl, mix tomatoes, a drizzle of EVOO, and salt and pepper to taste. After bread is toasted, place slices on a serving platter. 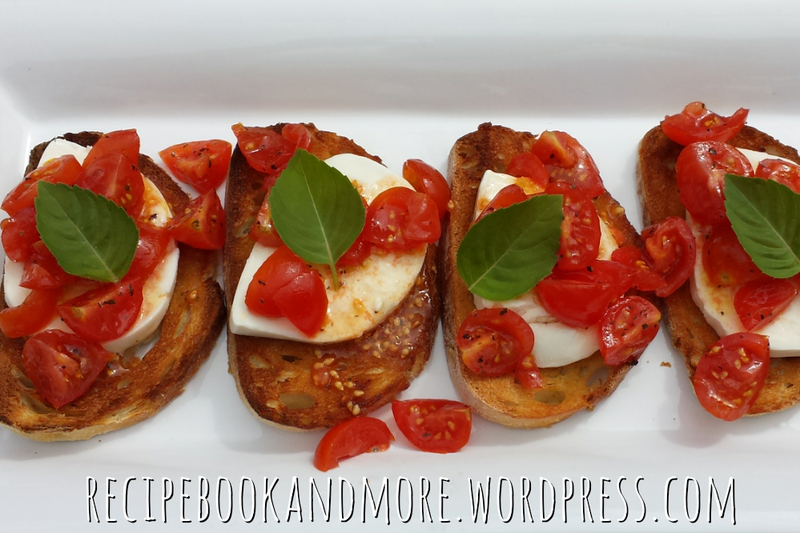 Top with a slice of mozzarella, then tomato mixture. Garnish with fresh basil. Our basil plants are still growing like crazy. 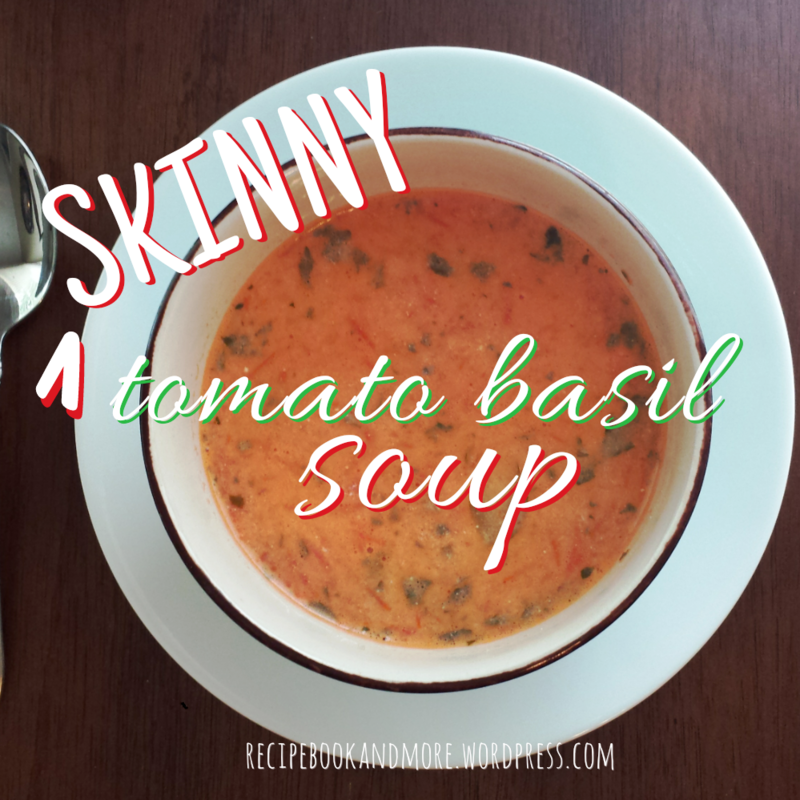 I have used them in pesto, tomato salads, and now in this creamy tomato basil soup. It is lightened up by switching out cream, and using nonfat plain Greek yogurt. 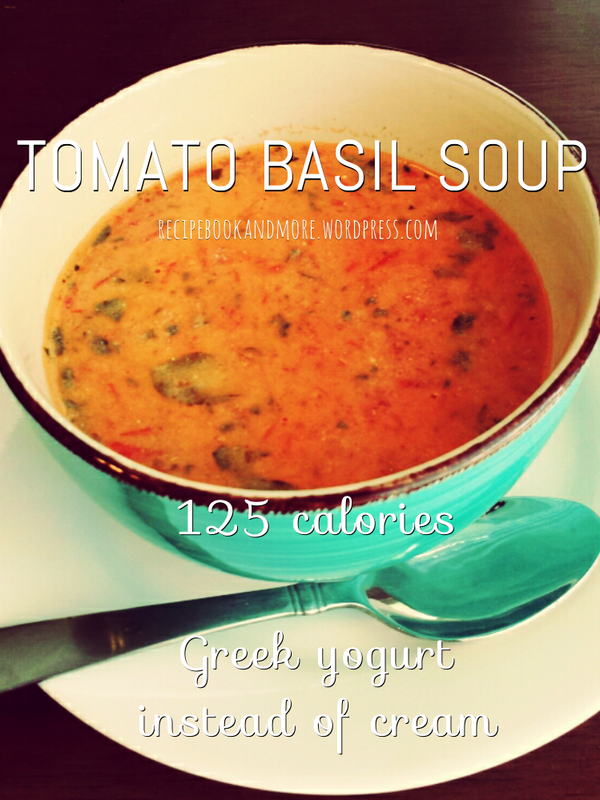 There are only 125 calories and 7 grams of fat! 1 C. chicken (or vegetable) broth – try homemade! WHAT YOU DO: In a medium sized pot add olive oil, garlic, and tomatoes and saute on medium heat for a few minutes. Add broth, basil, and pepper. Cover, reduce heat to med-low, and let simmer about 15 mins. Remove from heat and let cool 10-15 mins. Use an immersion blender (or transfer to a blender in small batches) to puree. Then reheat it, add yogurt and serve. Garnish with fresh basil. Here’s a batch of pesto I made with some basil from the garden. I used pine nuts, which are pretty expensive, but I’ve since learned you can use walnuts, pecans, or even almonds instead. It keeps in the fridge for 1 week, or you can freeze in freezer-safe containers or ice cube trays for up to 6 months. 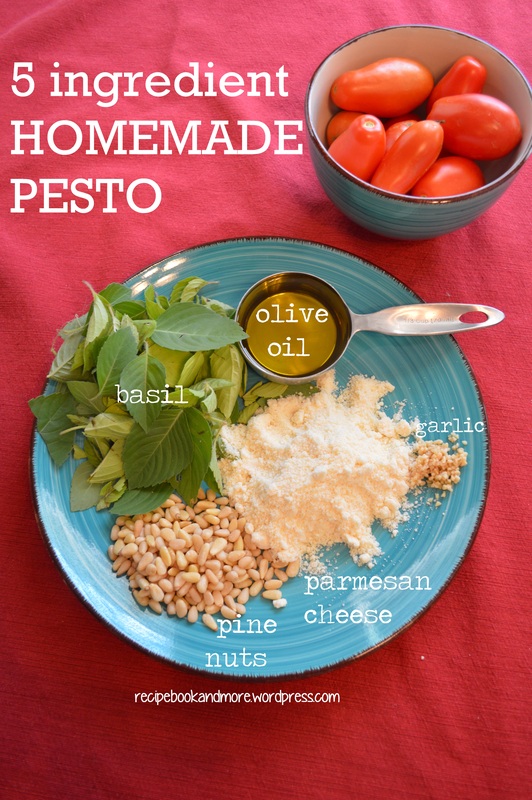 Also you can adjust the olive oil so the pesto is as thick or thin as you like. 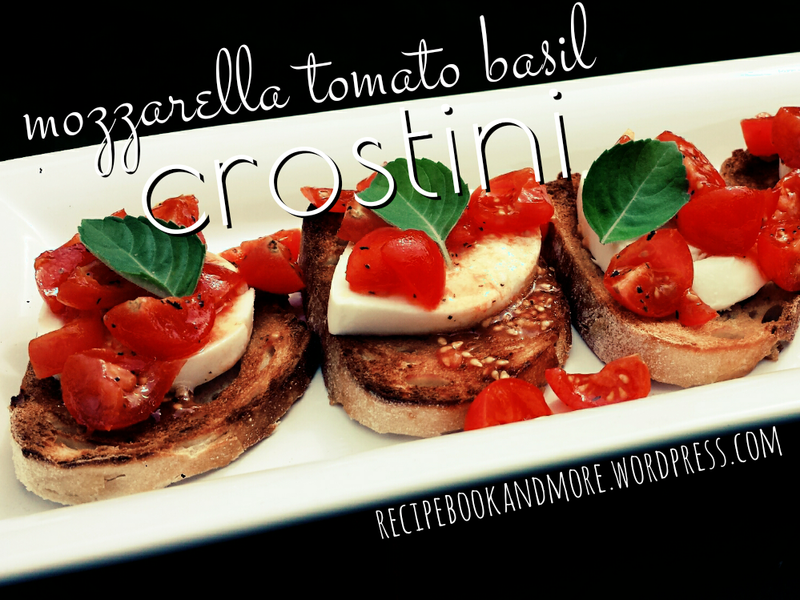 It’s great for pasta, or even as spreads on flatbread crackers, or on sandwiches as a spread. 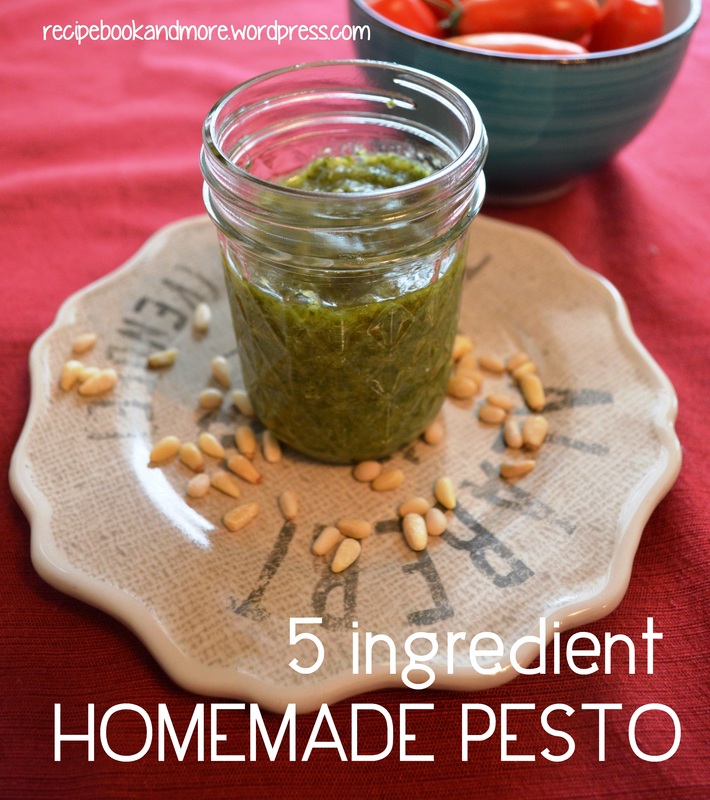 In a food processor: combine basil, garlic, pine nuts, and cheese. Add olive oil as it’s running until emulsified. To make it thinner, add olive oil until it reaches desired consistency. Store in an airtight container and refrigerate up to 1 week. Or place in freezer-safe containers (or ice cube trays) to store for up to 6 months in the freezer.